I bought these two glosses last month and loving them so far…time to share my views on these cute babies, So let’s begin. 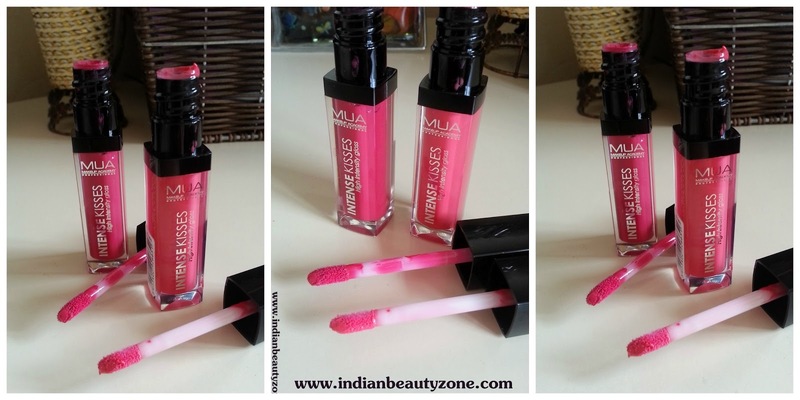 The newest lip gloss in the MUA range! 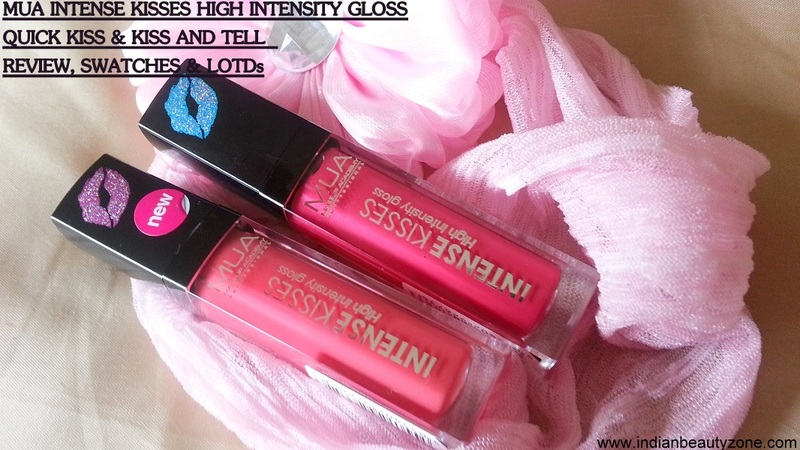 Intense Kisses lip gloss £2 each. 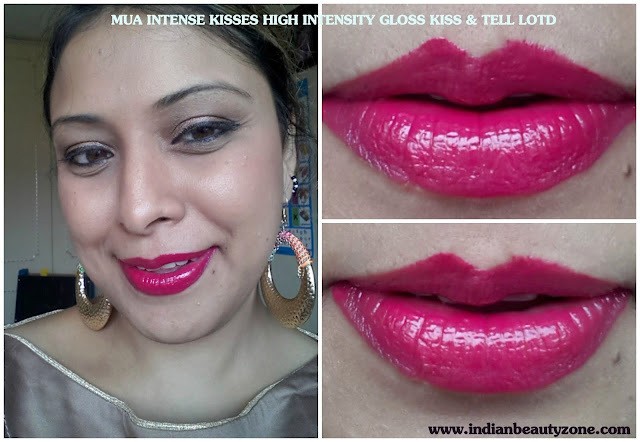 They are sealed with a kiss in a high-intensity gloss which comes in a wide range of bold colours. Adds just the right amount of glamour to lips whether you're strutting down the street or the red carpet. Wear alone or over your favourite MUA lipstick colour for gorgeous kissable lip effect. 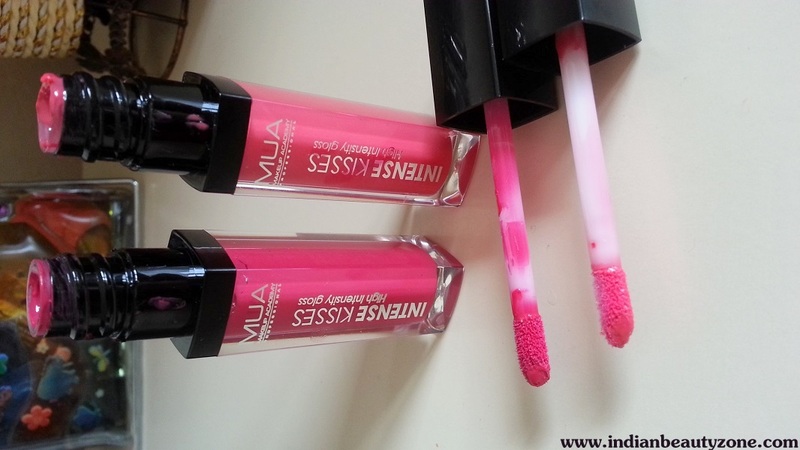 Now it's time to pucker those lips up and get kissing away with your new intense MUA kiss lip-gloss, MWAH! I bought two shades named Quick Kiss & Kiss and Tell. They sit somewhere between a lipstick and a lip gloss, so have the colour of a lipstick and shine of a gloss with no stickiness. The thicker you layer, the glossier it looks and makes your lips fuller. They have the pigmentation of a lip stick but the texture and look of a gloss. Staying power is decent as well. It lasts for more than 4 hours but after eating it starts fading n leaves a pretty tint behind. It is very hydrating and doesn't bleed or transfer at all. feels very light. The consistency of this gloss is thin and smooth. It would suit all skin tones. Kiss and tell is a dark vibrant pink with red undertones which is one of the bold shades and brightens your look, mood and face. The colour is very gorgeous and perfect for the summers. 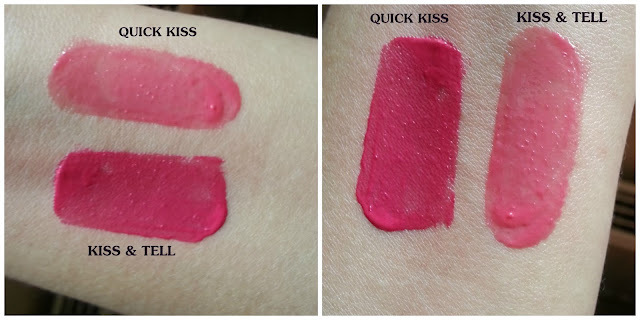 It is more pigmented than Quick Kiss. 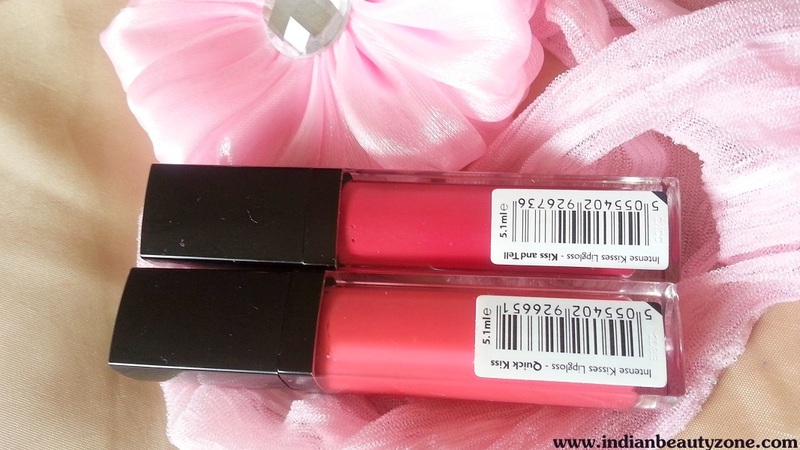 It has sheen to its finish; it isn't super glossy but gives lips a healthy looking shine. It is simple yet attractive. It comes in a transparent square case with a black twist cap and coloured lip tattoo engraved on the top of the bottle. Just right on the bottle cap, since it’s transparent, one can easily locate the shade. Fits in my small purse and is very sturdy. No spillage or leakage. • Availability can be issue in India. If you are lip gloss lover and want to try some pigmented gloss then must try these lip glosses. It is pocket friendly and lasts on lips for hours without eating or drinking. What more can you expect from gloss! So must give them a try!!! Would be getting Lips are Sealed n Stolen Kisses myself. Both r indeed v pretty shades.. I love darker one a lot as u knw I love bold shade ..
Justst Tej Dahlingg.. awesome pics and such a gorgeous shades.. the first one is such a beauttyy loved it on uu!! i love the darker one too niesha..
both the shades are lovely tej and suit u a lottt!!! Indeed both r v pretty shade.. Loved the colors! Nice review Tej! Beautiful colours!! I love the result in your lips! Your reviews are the very best! Glad u loved my reviews..
Nice review doll! YOu look so beautiful!!! Love the shade and its spot on for your color. Lipgloss is one of my fav and let me see if I can find the brand over here. So far, I haven't heard of the brand, maybe I have been doing any retail therapy since of late. Will try when I am at the shopping malls. yeah u should try navneet...they r indeed v pretty n pigmented gloss..
Wow gorgeous shades i love both of these and you look pretty Tej. I love both shades Tej.... you have a killer lips!!!! Have a lovely september my dear! Its Anu from Beautykafe. Thanks for your visit. Great review here. I am not a lip gloss person, but I'd try a shade like Quick Kiss. They both look great on you though. Quick Kiss is my favourit! WOW! Loving the hot pink shade!! Kiss and tell is a gorgeous bold shade on you! Quick kiss is a nice more subtle version, thanks for sharing, xoxo. Thanks inez ..I love bold shades..
awesome bold color! <3....loved the swatches by you!! 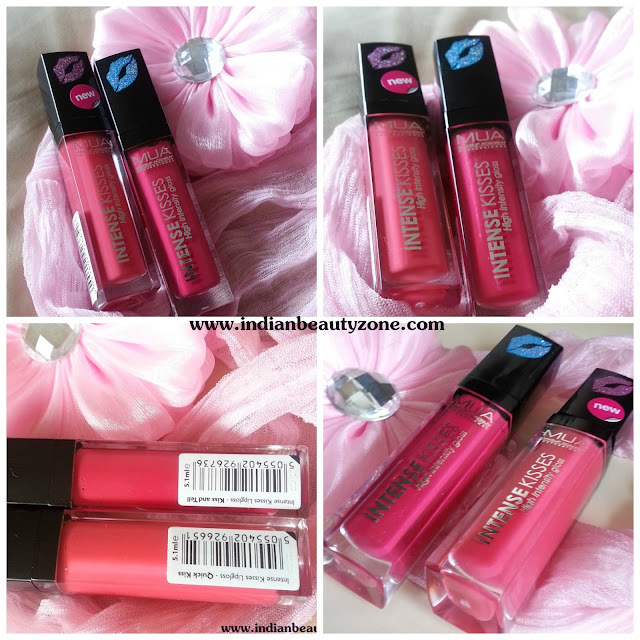 It's good that you get cheap and such pigmented, not drying lipglosses! yeah indeed they r v much pigmented n easily affordable ..
do give them a try egle..
Lovely shades and awesome pictures Tej! I am always in search for good lip glosses! Will try these out, for sure! thanks for following dear..This is my friend blog..I am writing as a guest.. Thank you for lovely comment ..do give a try .. Awesome color sweets and both the colors look great on you ! 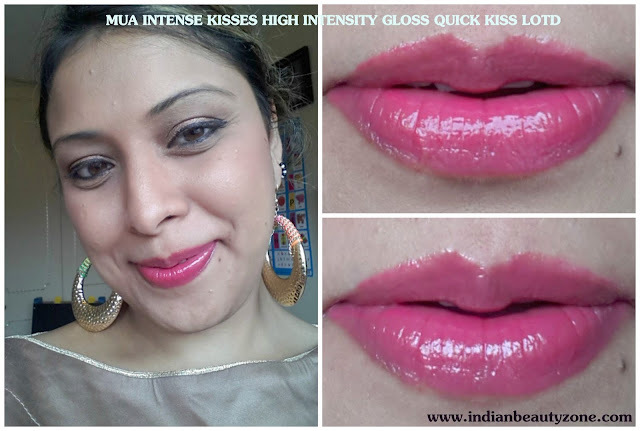 I am not much into gloss but your lip swatches tempting me to buy it dear :) lovely ! A lot of kisses for you darling!!! !